Charles Bernstein's new book has arrived from Chicago University Press, at my London address, enveloped in several stiff boxes like some kind of rare document. This book, Attack of the Difficult Poems, is a must-have, must-read, for every practicing poet in Britain and Ireland. They should buy their copies online today. This may involve wasting money. But it will be worth it. Bernstein's book is a rehash of a lot of stuff he has written or said previously, and a lot of the articles appear elsewhere. I'd read more than 50% of it. But I am glad to have 100% of it under one pair of covers. 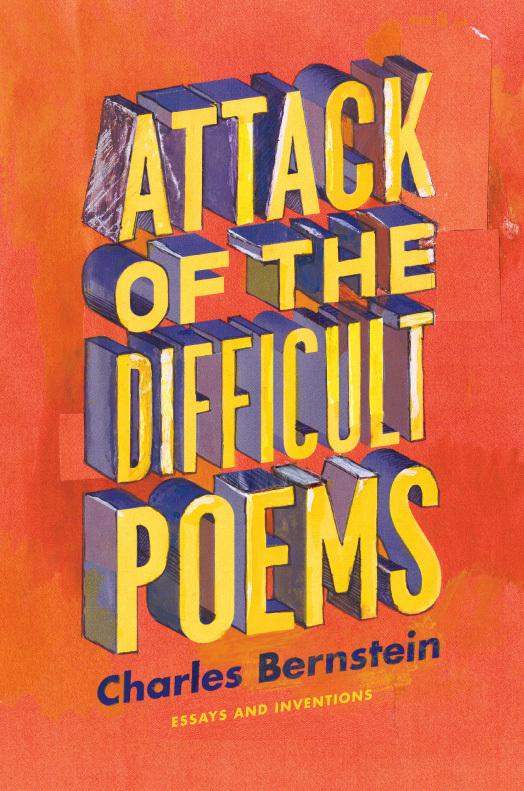 Bernstein's book is a bee-in-a-bonnet extravaganza, washed down with whiskey and malarkey pills - a variety act of different essays assaying styles and viewpoints, as if Wilde had been a computer programmer with a Woody Allen sense of humour. Like most important thinkers, it no longer matters whether he is right or wrong - the ideas are sufficiently embedded in the cultural argument of our times, to matter anyway. And that's probably a good thing, because if CB was a debater he'd be a style debater, not a content debater. His main bugbears in this book are the difference between mainstream/accessible/Billy Collins-type poetry, and modernist/difficult/innovative poetry; how poetry is ever-changing and renewing itself through performance and the multimedia web of technologies out there now and to come; that poems should not be sentimental or sell old maxims, but maximise the thwack of the localist imperative - make it newt. Finally, he explores pedagogy, creative writing's failures and possibilities, academic writing, and the need for a poetics of criticism and vice versa; and ends it all with a recanting of all his major positions in a weird document that really is just slapstick. Along the way he coins a few phrases, and reminds us that he is no fan of sincerity, is a fan of artifice, and will use a pun like some voodoo dolls use pins. I don't agree with half of what he wreads or writes, but neither does the other half of me not. Attack Big Mac! Digest Big Chuck!